Although I'm pretty sure they already had a grand opening full of freebies, the new Rita's in Santa Monica apparently deemed it not grandiose enough because they are celebrating their Official Grand Opening next Friday, September 20th. 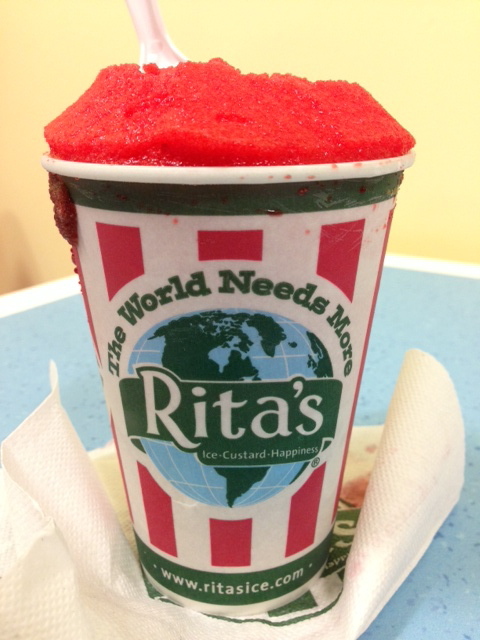 They will once again be doling out FREE ITALIAN ICE ALL DAY. Also, the first 50 people in line at 10 a.m. with an unwrapped children's game donation for the Boys & Girls Clubs of Santa Monica will receive FREE ITALIAN ICE FOR A YEAR (one free Ice per week for 52 weeks). Sounds pretty grand indeed (sorry). Note: they rotate their flavors often, but current U.E. favorites: Strawberry Lemonade, Black Cherry and Pumpkin Cheesecake.